In a healthy mouth, teeth are surrounded by gingival and mucosal tissue. Gingival (gum) tissue is coral pink, thick, and dense under a microscope. This tissue forms a tight seal around the teeth serving as a barrier against the penetration of bacteria to the underlying supporting bone. 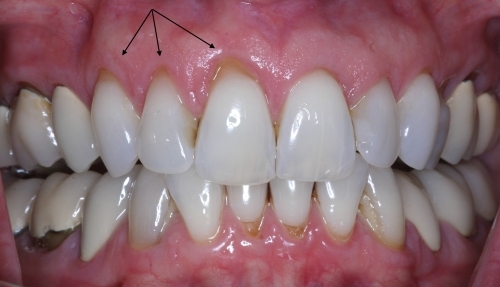 The gingiva also helps to withstand trauma from eating and brushing. 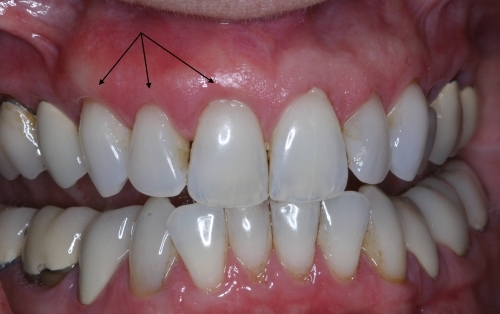 Dentists refer to this band of tissue as the “attached” or “keratinized” tissue. The second type of tissue, mucosa, is found directly below the gingiva. Mucosal tissue is red, very thin, and appears loose under a microscope. It does not seal tightly around the tooth, nor does it withstand trauma very well. Dentists refer to this zone of tissue as the “alveolar mucosa”. 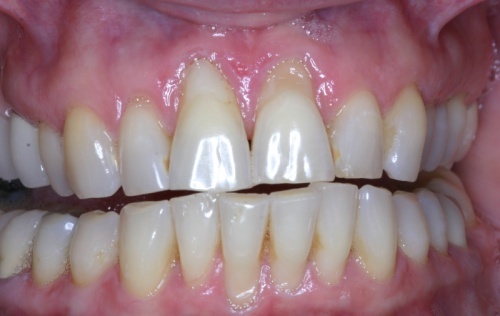 When there is only minor recession, some healthy gingiva often remains and protects the tooth, so that no treatment, other than modifying home care practices, is necessary. In this case, Dr. Wilson will often have the patient return one year later to compare measurements and photographs to determine if the recession is progressing. However, when recession reaches the mucosa, the first line of defense against bacterial penetration is lost. At this stage, no matter how meticulously the patient tries to control the bacteria, there is a greater chance of bacteria penetrating and affecting the underlying supporting bone around the tooth. In addition, gum recession often results in root sensitivity to hot and cold foods as well as an unsightly appearance of the gum and tooth. Also, gum recession, when significant, can predispose to worsening recession and expose the root surface, which is softer than enamel, leading to root caries (decay) and root gouging. So, your gum may have receeded for a variety of reasons, including improper tooth position, aggressive tooth brushing or periodontal disease. Prior to treatment, Dr. Wilson will help you identify the factors contributing to the problem. Once these contributing factors are understood, a soft tissue graft procedure is often advised to repair the defect and help to prevent additional recession and bone loss. 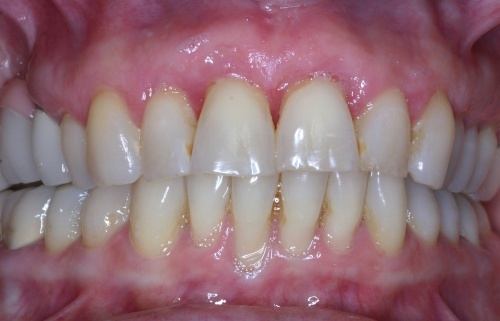 The most common procedure Dr. Wilson performs for root coverage and for thickening/strengthening the attached gingiva is called the subepithelial connective tissue graft. This minor surgery, which is considered the gold standard of the soft tissue grafting procedures, takes about 45 minutes per tooth treated. During the procedure, the affected tooth is cleaned thoroughly and a small recipient pouch is created to receive the graft tissue. Then, the palatal donor tissue is obtained in an atraumatic fashion utilizing a tiny incision. This small palatal incision is closed, and the graft is fitted and secured within the recipient pouch, both with suture material that can only be seen clearly with magnification. Most patients report little to no discomfort with this procedure, and follow-up visits are scheduled at approximately 2 and 5 weeks.